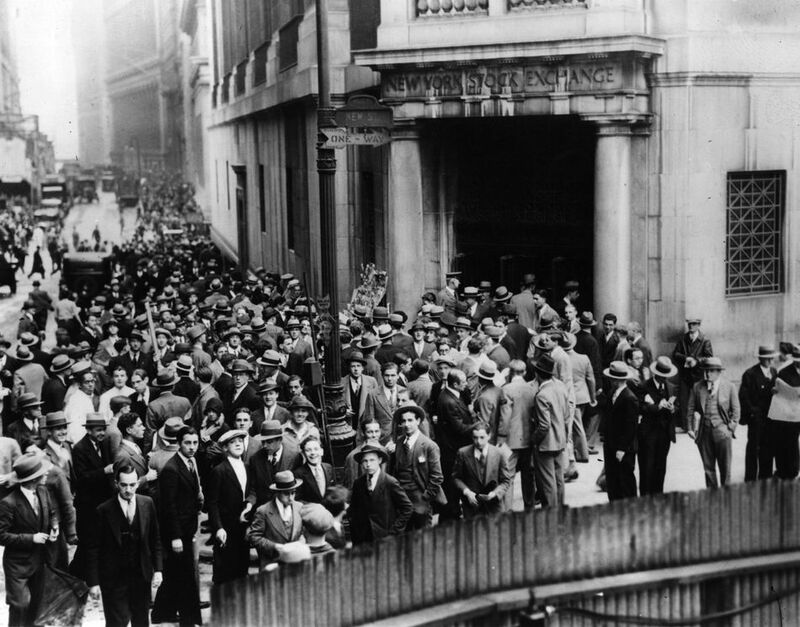 The timeline of the Great Depression was from August 1929 to June 1938, almost 10 years. The economy started to shrink in August, months before the stock market crash in October. It began growing again in 1938, but unemployment remained above 10 percent until 1941. That's when the United States entered World War II. March 4: Herbert Hoover became president. His laissez-faire economic policies did little to stop the Depression. He believed a free market economy would allow the forces of capitalism to fix any economic downturn. As a result, he lowered the top income tax rate from 25 percent to 24 percent. August: The economic activity from the Roaring Twenties reached its peak. After that, it started to contract. It was the true start of the Great Depression. That same month, the Federal Reserve raised the discount rate from 5 percent to 6 percent to prevent inflation and defend the gold standard. June 17: Hoover signed the Smoot-Hawley Tariff Act. It raised taxes on 900 imports. It originally was supposed to help farmers but ended up imposing tariffs on hundreds of other products. Other countries retaliated, setting off a trade war. As a result, international trade began to collapse. November 7: The Bank of Tennessee failed. That led to failures of affiliate banks in the next few days. Although the economy was improving, weaknesses in the banking system pulled it back down. Only one-third of the nation's 24,000 banks belonged to the Federal Reserve banking system. Non-members did not have enough access to reserves to fend off bank runs. As bank failures grew, depositors rushed to banks to pull out their savings. Banks only hold 10 percent of all deposits, so they can lend out the rest. A bank run will quickly put it out of business. In the fall of 1930, bank runs spread throughout the Southeastern United States. By the end of the year, 1,300 banks had failed. December 11: The Bank of the United States failed. It was the fourth-largest bank in the nation, the largest bank failure in history at that time. Worried about budget deficits, Hoover returned the top income tax rate to 25 percent. The economy shrank 8.5 percent. The unemployment rate rose to 8.7 percent. Deflation set in as prices fell 6.4 percent. January: Congress created the Reconstruction Finance Corporation to lend $2 billion to financial institutions to prevent further failures. In July, Congress authorized it to lend money to states for relief. June 6: Hoover signed the Revenue Act of 1932. It increased the top income tax rate to 63 percent. He wanted to reduce the federal deficit. Hoover believed it would also restore confidence. Instead, higher taxes worsened the Depression. Franklin Delano Roosevelt took office. He launched the New Deal on March 9 with the Emergency Banking Act. It closed all U.S. banks to stop devastating failures. On March 20, the Government Economy Act cut government spending to finance the New Deal. Two days later, the Beer-Wine Revenue Act ended Prohibition and taxed alcohol sales to raise revenue. On March 31, the Civilian Conservation Corps was launched to hire three million workers to maintain public lands. May: The Federal Emergency Relief Act created more Federal jobs. The Agricultural Adjustment Act paid farmers to limit crops, thus raising prices. The Emergency Farm Mortgage Act provided loans to save farms from foreclosure. The Tennessee Valley Authority Act built power stations in the poorest area in the nation. The Securities Act required companies to educate investors when issuing stocks. June: The government stopped repaying dollars with gold. The Home Owners Loan Corporation refinanced mortgages to prevent foreclosures. The Glass-Steagall Act separated investment banking from retail banking. it also created the Federal Deposit Insurance Corporation. The National Industrial Recovery Act created the Public Works Administration which added more jobs. The National Recovery Administration outlawed child labor, established a minimum wage, and limited the workday to eight hours. It also allowed trade unions to bargain with employers. The Emergency Railroad Transportation Act coordinated the national railway systems. November 8: The Civil Works Administration created four million construction jobs. Forty-eight dust storms pummeled Oklahoma and surrounding states. Farmers slaughtered six million pigs to reduce supply and boost prices. The public criticized the waste of food. FDR created the Federal Surplus Relief Corporation to use excess farm output to feed the poor. April 15: Black Sunday was the worst dust storm ever. FDR passed the Soil Conservation Act to teach farmers sustainable methods. February 26: The Soil Conservation & Domestic Allotment Act paid farmers to plant soil-building crops. April 8: The Emergency Relief Appropriation created the Works Progress Administration to hire 8.5 million people. May 20: The Rural Electrification Act helped farms to generate electricity for their areas. July: The National Labor Relations Act/Wagner Act protected workers' rights and created the National Labor Relations Board. June: The hottest summer on record began. Eight states experienced temperatures at 110 degrees or greater. August: Texas experienced record-breaking temperatures of 120 degrees. Throughout the year, the heat wave directly killed 1,693 people. Another 3,500 people drowned while trying to cool off. FDR cut spending to reduce the debt. That cutback in New Deal spending pushed the economy back into the Depression. FDR pushed Congress to enact a $5 billion relief program. It included the Federal National Mortgage Association that resold mortgages on the secondary market. The New Agricultural Adjustment Act remedied the 1933 AAA. The Fair Labor Standards Act established the U.S. minimum wage, overtime pay and youth employment standards. In 1938, FDR abolished mark to market accounting. Some experts believed it forced many banks out of business. The rule forced banks to write down their real estate as values fell. FDR's new rule allowed them to keep these assets on their books at historical prices. November: FDR convinced Congress to repeal the U.S. military arms embargo to France and Britain. December 7, 1941: Japan attacked the Pearl Harbor Navy base. Congress declared war on Japan.